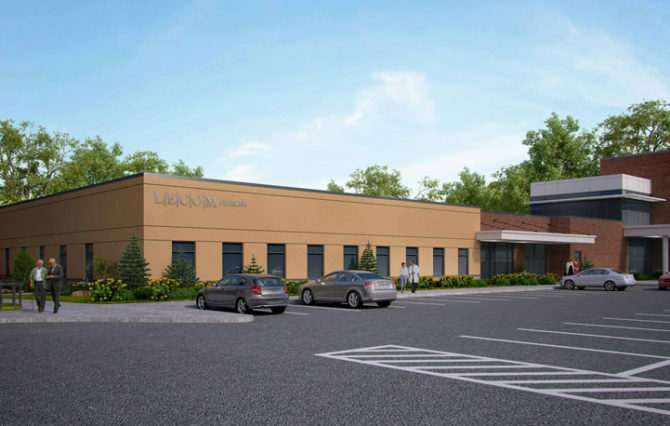 Home » Archive by category "Corry Hospital News"
Corry Memorial Hospital (CMH), an affiliate of LECOM Health, held a groundbreaking ceremony for the Corry Medical Arts Building (MAB) which will house the Corry Rural Health Clinic. The Rural Health Clinic will house both primary care and specialty physician offices. Construction of the nearly 10,000 square-foot building will start in early November and be completed by June 2019. Roth Marz Partnership designed the state-of-the-art Medical Arts Building to connect directly to and blend seamlessly with CMH. The building features 22 exam/treatment rooms that provide physicians and patients an exceptional environment for healthcare delivery. The multi-disciplinary clinic will provide a broad spectrum of care including OB-GYN, Orthopedic Surgery, Endocrinology, General Surgery, Urology, Podiatry, Geriatrics and Internal Medicine, and Family Medicine. The new building also has a multi-purpose conference room that can be used for physician and patient consultations and will serve as a teaching center for LECOM students and residents. LECOM Health and CMH will employ 18 full time equivalent physicians and staff with an annual payroll of $2.6 million Dollars. CMH is investing $3.2 million dollars to construct and equip the Medical Arts Building. In August, Pennsylvania Governor Tom Wolf announced that the project will be partially funded by a $1 million Redevelopment Assistance Capital Program grant. Among the guests at today’s ceremony were Pennsylvania Senator Michelle Brooks, Pennsylvania Representative Curt Sonney, Erie County Executive Kathy Dahlkemper, Corry Mayor David Mitchell, and Erie County Councilman Scott Rastetter. Building Systems, Inc. has been hired as general contractor to begin construction this month. Opening in 2012, the New Corry Memorial Hospital is a state of the art medical center that adds more services and more care. Corry Memorial Hospital has been serving the region for over 100 years. Established in 1894, Corry Memorial Hospital has gone through several transformations leading up to today. The hospital currently has 82 beds and has over 25 different services for inpatient and out patient use. Employing over 230 people, the hospital has over 60 physicians and over 60 nurses on their available staff. In an effort to provide the community with a healthcare facility that embraces all aspects of a family’s health cycle, Corry Memorial completed a $4.5 million building project in 2001. This undertaking includes outpatient friendly access to clinical areas, a Women’s Health Center, a new wing to house the “New Hope” Behavioral Health Unit and a new main entrance.